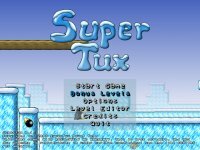 SuperTux is a free classic 2D jump'n run sidescroller game in a style similar to the original Super Mario games covered under the GNU GPL. This is the old stable version of SuperTux, also called Milestone 1. It is very stable, and the best choice for extremely low resource machines. This version is approximately 12 years old.